The cultural significance of the Varta/Colombia team riding the Tour de France in 1984 is something I'm simply unable to explain. The social and political milieu that enveloped that event, and thus produced the outsized response from Colombia's population is as complex as it is painful to relay. But my inability to fully explain this hasn't stopped me from trying...or from having a blog almost entirely devoted to that pursuit. So it's in that spirit that I share the video below with you. It's easily one of my favorite internet finds in some time. The video is from French television (1984), and details the rise of Colombia's "exotic" riders at the Tour de France. Aside from being a wonderful time capsule of sorts (which thus includes the prevailing attitudes regarding Colombian riders at the time), the video is of interest to me for several other reasons, which I've listed below the video. Details, background information, and where are they now? José Beyaert, who was traveling with Colombian radio weighs in. If you don't know who Beyaert was, I urge you to go read this interview with Matt Rendell, which details his unbelievable past in the cycling (and in Colombia). Matt wrote Beyart's biography. It's worth mentioning that it was in this Tour (1984), that Beyeart "threatened to break Laurent Fignon's jaw on one occasion ...due to Fignon swearing about them [Colombians]" according to Matt Rendell. Beyaert loved Colombia, and decided to stay and live there as a result. That Colombians were blamed for crashes on this video doesn't surprise me. Cycling in the 1980s was notoriously closed-off, and whoever the "new guys" were always got the blame. At the Piccolo Giro in 1974, "The Colombians" were blamed, as detailed by Alvaro Pachon. Americans got the same treatment later, as Andy Hampsten mentioned in this interview. Jose Clopatofsky is shown (who happens to look a bit like American Ted King), a reporter for the newspaper El Tiempo. Jose is still involved in journalism, and mostly writes about car racing. I should also mention that Jose was friendly with my father back then, as he was (and still is) the editor of Motor Magazine, which my dad wrote for. Small world, small country. Is that really Marc Durant from Systeme U? No. The label is wrong. That's Jairo Clopatofsky. Yes, another Colombian with the same last name. He's the cousin of the El Tiempo reporter who appears earlier in the video. Today he is the general director of the Colombia-Coldeportes team. He's had a long career in politics, and was recently interviewed by Cycling News. "The Hunchback" that Durant mentions is obviously Fabio Parra, whose position on the bike is still unlike any I've ever seen. In case you're wondering what "The Hunchback" is up to these days, he does very well for himself. During his years with Cafe De Colombia and Kelme, he put himself through college/university (an absolute rarity for someone with is upbringing in rural Boyaca), and today owns a large company that makes plastic containers, including bidons. He has also dabbled in politics from time to time. As you watch Marc Durant speak about Martin Ramirez (who signed a contract with Systeme U for the Tour), and refers to him as being a "back hills Arab", notice that he seems surprised by the fact that he can "really ride". Keep in mind that only a month before this interview, Ramirez had won the Dauphiné Libéré against a very much on-form Hinault. He beat the Britton in the mountains, and then in the final time trial for good measure. An amazing feat, when you consider that Ramirez was an amateur, who had never been out of Colombia, let alone raced against professionals of any caliber. First time racing among professionals, he beats Hinault. Yup, he could really ride. At least Durant puts on a funny/self-effacing voice at the end. Through the whole thing, Ramirez's facial expressions are both endearing and priceless. Where is Ramirez today? He's married and living happily in Colombia. He continues to ride, and doesn't look much older after all these years. Here's a video interview with him (which is translated into English by the interviewer), where he recounts his victory against Hinault at the Dauphiné Libéré. It's worth mentioning, as I've done before, that Hinault famously paid Pacho Rodriguez to retire from that race so he could win it, only to have Ramirez beat him anyway. Several riders reported having seen Hinault and others in his team trying to crash Ramirez out during the last stages. I talked about this with Matt Rendel, which you can read about here. Hector Urrego, the famed Colombian broadcaster and journalist. The one my brother and I listened to on the radio every day doing commentary. 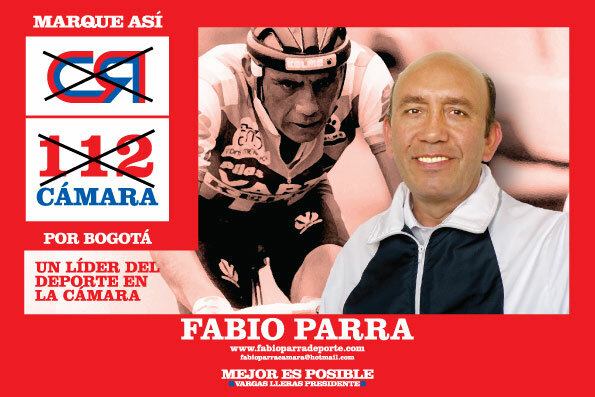 Urrego is still a leading voice in Colombian cycling in both radio and print. You can follow him on Twitter here. Tip: Urrego is usually among the first to break news regarding Colombian cycling online. If one of you speaks Spanish, and is a Twitter user, consider sharing this video with him, doubt he's ever seen it. Perhaps my favorite moment of the video. Note the man who is overcome with emotion as he screams out "Viva Colombia, Viva Herrera!" with tears streaming down his face. He is not a fan or a family member of Herrera's. He's a member of the Colombian press. One of the men who did daily commentary on the stages at the Tour de France actually. It's worth mentioning that he's overcome with emotion after Herrera finished stage 15 (a hilly stage finishing in Grenoble). So this celebration is as a result of Herrera coming close to winning a stage, but not actually winning. Herrera being close caused this outpouring of emotion (and similar ones all over the country). It wouldn't be until two days later that Herrera would win his first stage at Alpe D'Huez. Can you imagine how the Colombian press reacted then? Allow me to tell you how they reacted: they cried on the air to the point where it was hard to understand them. They wept and wailed uncontrollably. It was a magical moment. Millions of us listening wept and wailed uncontrollably as well. But those tears were not exclusively shed because of sport, but also because of the complex and horrendous situation that the country was faced with. Cycling was an integral part of the Colombian experience at the time, in a way that is impossible to convey because of its severity. Hence the over-the-top response to such events. I guess these outbursts were our version of the times when Paul and Phil semi-excitedly said that Armstrong was "dancing on the pedals" to American audiences, or when they almost casually said "Beloki has gone down, and Armstrong has taken to the grass." Needless to say, things were just different in Colombia back then for numerous reasons. Very different, and that's what makes it so hard to explain why an entire nation wept at once in 1984. We were constantly on edge, so mentally exhausted from hardship that we didn't just enjoy cycling. We needed it. But I see a glimmer of hope from time to time. As I watched this video for the first time, my American wife sat next to me. She was able to tell that the video, and the memories it represented meant something to me. When the video ended, the room was suddenly quiet. Out of nowhere, and for god-knows what reason, my wife (who is not interested in cycling at all) suddenly said to me: "Do you want me to tell you the name of every cyclist I know of?" "Sure", I said, half-smiling at the prospect of hearing this unrequested listing of cycling's superstars. She started to list them, "Rigoberto Uran, Fabio Parra, Sergio Henao, Mauricio Soler, Ramon Hoyos, Lucho Herrera," When she arrived at Herrera, she paused. "You listened to him race on the radio as a kid. He won at Alpe d'Huez." She smiled proudly. Clearly, this is the type of information you gather after being with someone for over twelve years. But I knew that she fully understood what those memories meant to me, and why those moments meant so much to an entire nation. I could tell that she knew. Sure, it had taken years of me telling numerous stories, of me explaining endless historical events, as well as several trips to Colombia. But she really, really, understood. While most of the world could not possibly care any less about a subject like Colombian cycling in the 1980s if it tried...it means the world to me. So while cultural differences and a varying levels of interest in subjects like these hold us all apart, it's absolutely fantastic to know that there's hope, and that we can relay these complex sentiments to one another. And it only takes about twelve years to do so. Not bad. As wonderful as this video is, it would have been of little use or significance to me without a proper translation. While I'm able to get by when I'm in France (foolishly asking for water in French, proudly saying that it should be "without bubbles", or for "a train ticket to" and then pointing to a map), I'm by no means fluent in French. As such, I had to enlist a reader of the blog (who lives in Bali) to help me get an accurate translation of the video. He in turn, recruited a friend from Brittany who was crazy enough to help him/me with this through Skype. Seriously. So thanks to Ruben (this is his blog) for the HUGE help. I should also mention that a great article of the time which captures an interesting amount of information about the Cafe De Colombia team and Colombia in general (largely due to its unbelievably inaccurate depictions of Colombia) can be found here. The article comes from Mike Spriggs' collection of vintage Winning Magazines, which he posts about on his Gage+DeSoto blog.